Saras Feijoo, our recent Artist in residence, is currently running an *ALL OR NOTHING* Kickstarter campaign for the FIRST Edinburgh Contemporary Clown Festival. We certainly support her on this journey and would love to invite you to support her too! From 3rd to 5th May 2018, we are launching the Edinburgh Contemporary Clown Festival to bring world-class theatre clown performances to Scotland and share the humanity, passion, honesty and connection within the unique art of the contemporary clown. Taking place at the Assembly Roxy, the Clown Festival will not only showcase the most beautiful part of the contemporary clown: honesty, connection, openness and humanity – characteristics innate to this genre, it will also continue to build and nourish Scotland’s growing community of clown artists, supporters and audience. 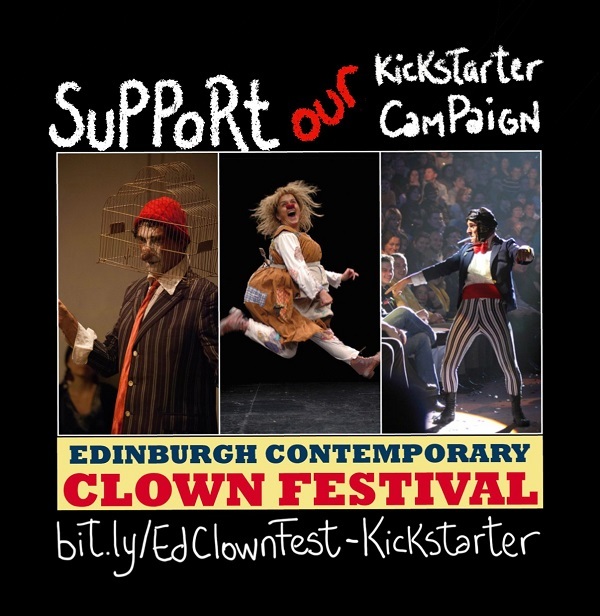 We are bringing international pioneers in the contemporary clown genre to perform in Scotland for the first time. The program includes Gardi Hutter (Switzerland), Ricardo Puccetti – Lume Theatre (Brazil) and Johnny Melville (Barcelona/Scotland) and, as a Scotland-based artist, Saras Feijoo itself. Our well attended and ever-growing co-production, Clown Cabaret Scratch Night will warm up your heart on the 28th April, the weekend just before our international acts, presenting the work of Scottish based clown artists. Contemporary theatre clown is about honesty, vulnerability and connection. This art makes us become visual participants of an emotional journey that bring us closer to our own humanity. We can totally make this happen with your support. Take action today and go to bit.ly/EdClownFest-Kickstarter to donate. Every little helps a mile!